"LEFT BEHIND" AND THE SPIRIT OF DESERTION. "The situation of the ship on the fifteenth morning,"
'Click' on the image above for a nautical overview. Caught in a gale lasting two weeks the stricken ship carrying the Apostle Paul has been driven westwards across the Mediterranean sea. On the fourteenth night the crew have sensed that they are approaching land. After taking soundings they know that they are in shallow water. They let go four anchors from the stern and pray. Now the vessel lies straining at anchor in the howling gale. The vessel pitches and rolls. They are trapped against a treacherous lee shore in the hours of darkness. There is no way to sail off into deep water again. During the night the four stern anchors are barely holding the vessel from shipwreck. But for how long? Now, caught on a lee shore off the coast of Malta a sinister drama begins to unfold. In the midnight hour Paul is up on deck and observes some of the crew behaving furtively. As he watches he sees that they are preparing to lower the lifeboat over the side. These crew members are secretly preparing to desert the ship. They are going "A.W.O.L"! This is a serious matter. In military parlance are about to abandon their posts, to be "absent without leave". What had possessed these crew members to do such a thing? Certainly they were trying to save their own skins. Oh yes, they were "looking out for number one". But here is the horror of it all. These men had responsible duties to perform on that ship. And yet they had shown that they were quite ready to cast off and abandon their shipmates. Their full intention was to desert the ship. They were also prepared to walk out on their responsibilities as seamen and to leave the passengers to their fate. Oh yes. They would be OK, in their special cozy little vessel, leaving early to avoid the shipwreck. But the lives of the passengers were now in jeopardy. They were about to be left stranded aboard a stricken ship in a raging tempest. The deserters were quite happy for these people to be 'left behind'! What were these crew members thinking? Where was their heart? Had they not read, taken note of, and signed their commissioning papers when they shipped out? They were responsible for these people! Now, instead of attending to the passengers in their tribulation and seeing to their safe passage they were bound and determined to have an imminent departure In their cowardly mind they were "outta there"! They were running off! They were going to abandon them! They, as crew members, were going to "cop out", to "cut and run", to desert! The passengers would be left to perish in a watery grave. Oh yes. The ship and its passengers would be "left behind"! Dear saints, let us just pause for a moment. And let us take a close look at what is going on here. The crew are responsible for the safety and security of all on board. But what do we see? They are abandoning ship before they have been given leave to go. They are deserting their stations. Oh yes, they are exercising their own personal "choice". But their "choice" will mean the death of others. They have chosen to "cut and run"! This irresponsible act of betrayal is happening a time when they, the responsible members of the ship's company, are most needed. What an awful and shameful business this is! Well our God is not fooled or unaware of the conspiracy here. And He happens to have His representative right there on board. Our Apostle Paul sees right through this whole caper even as it begins to unfold. And he knows what is really behind their furtive actions. He takes a very dim view of this shameful and self-serving impulse and behavior. A desertion by the crew would have jeopardized the lives of everybody on board, including the lives of the despicable deserting crew members themselves. The Holy Spirit speaks to Paul alerting him to all this. And Paul alerts the captain. 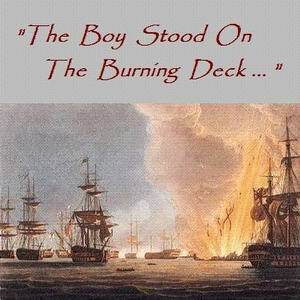 He warns him that the ship and the ship's company cannot be saved if the crew skips out. The crew members still loyal to the captain are summoned. They respond immediately and decisively to this budding act of treachery. They cut the lifeboat loose and let it fall away into the raging sea. And the cowardly and self-serving act is prevented; - just in time. The engraving above shows the ship's perilous situation as dawn breaks on the 15th day. FOR US IN THE WESTERN CHURCH TODAY. This is an issue of Christian devotion pure and simple. Shall we stay with our God through all this? Historic times are up ahead. They will probably open up on some future Jewish New Year. At that time a seven year peace covenant will be confirmed involving Israel and G-7 nations of Christendom. The trumpets will sound. And the awesome end-time drama will begin to unfold. The curtain will open. And the end-time saints will go up on stage. There they will take their places for the final acts of the play. The final three and a half years will see the 5th seal opened. This will be the "final witness" of the Church. And so the story of God for this era will come to its grand climax. What will this world and the watching angels see? And in particular, how will the western Church perform under pressure? When Jesus returns "will He find faith upon the earth?" - Luke 18:8 Will He find true loyalty and Christian devotion when He comes back? Or will He find that many, having been given no information or false information, will themselves desert from the Christian faith? And here is the key question. Are we ready to face the challenge Of Christian witness under pressure should we be called upon to do so? Or are we entertaining notions of abandonment, an inclination to in effect 'desert the ship'? IN THE FACE OF DANGER. Here in this sea story there is an important spiritual message for us to learn. The theme appears to be a warning to us from God. It concerns the issue of "dereliction of duty in the face of danger". We might also call it "abandonment" or in military parlance, "desertion", "going AWOL" or being "absent without leave". In this sea story God is sending us a message. And He is is calling us to true loyalty and Christian devotion. He is calling on us to "stick with Him until the end". Our story begins in Acts 27 with the voyage of our dear Apostle Paul. As you will recall, he was a prisoner under extradition to Rome. Why? Well he had appealed his case to Caesar. Paul was embarking on his last voyage, a voyage that would take him to the very center of power of the then known world. There he would complete of his life work and ministry. Unfortunately this is untaught in the western Laodicean style church of today. Combat veterans know what "baptism of fire" means. The popular church in the west today does not, (or will not), allow themselves to learn what it means. As with our Apostle Paul's voyage, there is to be a climax, a showdown at the end of this age. Many western saints have never been under fire for their Christian faith before. But we need not fear. We have been given many promises. Jesus Himself will keep, preserve, and cover us as we come (Gr. )"ek" or "in, through, and out of" our "hour of trial". (Rev. 3:10). Jesus has also charged us with the Great Commission. Right there in our commission He has given us His personal assurance that He will be with us until the end of the age. The scope of our commission is quite clear from the words of Jesus. Our assignment extends right on out to the very end of the age. (Mat.28:16-20) So we can be sure that our commission to serve God here on earth does not expire until the last day of this age, (or the end of our life, whichever comes first). Jesus Himself has promised us that He will not desert us in our hour of trial. He said that He would be with us "even to the end of the age". If He will be with us right through the end of the age then why should we desert the Captain of our salvation? How can we possibly entertain fond notions of skipping out seven years before the end of the age? Why should we toy around with any fancy ideas of absenting ourselves from the final 7 years of this age? We are His witnesses are we not? Doesn't that final 7 year period of this age involve the witness of the saints? Why are we even listening to a doctrine of the end time that is secretly undermining our faith, denying the blood covenant devotion, and has us giving up and deserting the ship? 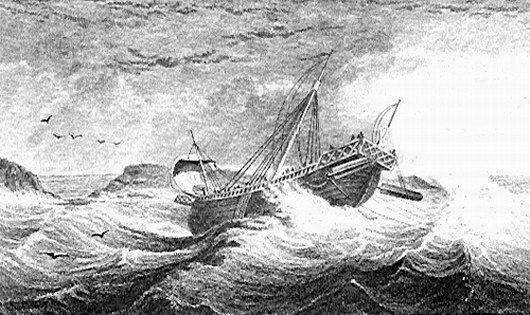 THE TEMPEST, AND THE SHIPWRECK OF THE APOSTLE PAUL. Let us return to our sea story now. The gale in the Med was a particularly awful one that year. It went on for two weeks and on board that storm tossed vessel things were grim. Towards the end all hope was lost. The details of this voyage from a nautical perspective have been wonderfully outlined in the website 'The Apostle Paul's Shipwreck It must have been quite a storm. The sailors girded the ship with ropes for fear it would break up in the raging tempest. Then they threw the cargo overboard. Next to go over the side was the ship's tackle and everything else that could be thrown overboard. Then they lashed the vessel with ropes to prevent it from breaking up in the howling tempest. During the night an angel of God appears before Paul. He is told the ship will indeed be lost. But he is also given a comforting word of encouragement. "God has given you the lives of all who sail with you". This was indeed a wonderful and timely assurance. On the fourteenth night the sailors sensed that land was near. They confirmed this by taking soundings. They were being driven towards a lee shore during a gale at night. This was the sailor's ultimate nightmare. They put out four stern anchors and prayed for daylight. The midnight hour brought that awful moment of reckoning. What would the sailors do? They knew that shipwreck was near. As officers and crew aboard that ship they had this information. The passengers did not. What to do? As we focus in on the story here the plot begins to thicken. The ship is doomed. It is on approach to an unknown shore. In the darkness the crew can hear the breakers downwind in the distance. There is no hope of sailing clear. They are now fully aware of their perilous condition. The ship lunges forward then is held back as the four anchor lines groan at the stern of the ship. How much longer can the anchors hold? Amidst the fear that clutches at their hearts certain members of the crew begin to waver in their devotion to the captain and the ship. They begin to entertain thoughts of their own personal survival. Towards the midnight hour they begin to think the unthinkable. They begin to think of desertion. Notions of abandonment and dereliction of duty begin to play upon their minds. Soon they were no longer a crew committed to the ship. They had become a rabble obsessed with thoughts of their own personal safety. Without proper authority a few of the crew members begin to toy around with some special plans of their own. They begin to entertain the idea of a special early escape. They fantasize, then they believe, and then they act upon their belief. They exclusive escape plan they hatch out is for themselves and for themselves alone. They plan to leave the doomed ship, and the ship's company. They plan to escape in the lifeboat. They will launch the boat over the side before the inevitable final crisis unfolds. There was no need for this. The crew had heard Paul's words of encouragement. They had heard his message of assurance. God had said that all on board that ship and sailing with Paul would be saved. But they had discounted the Word of God. They refused to believe the message the Apostle Paul had given them. Instead, the crew acts on the basis of the sum of its fears. They choose to believe that the ship will be wrecked with great loss of life. They believe the vessel will soon be breaking up on the rocks at night with all lives being lost in the sea. So what do we see? We no longer see a crew under the discipline of higher authority. They are now an unruly mob. They have switched over into a survival mode based on self. When that ship comes in they don't want to be on board! No sir! This escape plan they have hatched is for themselves. They have a special little boat. It is theirs. And now they are lowering it over the side. This little vessel of grace is for them, and for them alone! And as for the others? Well they will be LEFT BEHIND! Abandonment! Dereliction of duty! Desertion of the ship in its moment of trial! What a dreadful thing this is. Who were these men who were secretly lowering the ship's boat over the side in the midnight darkness? They were members of the ship's crew. These men had vital responsibility for the lives of all on board. These sailors had signed on with a commitment to serve on board that ship until the end of the voyage. So just what were they up to here? As sailors their duty was to ensure the safe passage and administration of the vessel until it came safely into port at its final destination. Their job was to see to the preservation of all the ship's company and the passengers sailing with them. Now, in this shameful act, they had become unfaithful to that commission. They had become sailors unworthy of their calling. Just what had happened here? Fear, it seems, was the key. Because of fear they had let go of their faith and lost sight of their devotion. And now they were about to become just an unruly gang of deserters. Those people on board had been entrusted to their care. Why then, had these crew members entertained this unfaithful and cowardly notion of abandoning the rest of the ship's company? Why were these sailors deserting the ship and its passengers just when their services were about to be needed most? -see Acts 27:30. "Come back and help passengers! Remember the penalty for this!" Another ship, the 'Finnpulp' had seen the glow of the fire and upon drawing nearer intercepted the departing captain's lifeboat. When the master of the rescue vessel learned that the captain had left his passengers on the blazing ship without trying to assist them to safety he was furious. He sent the derelict captain packing back to his ship. 90 lives were lost that night, 88 of them passengers. Shortly after 6.a.m. the burning ship rolled over and went down by the stern in a cloud of steam. 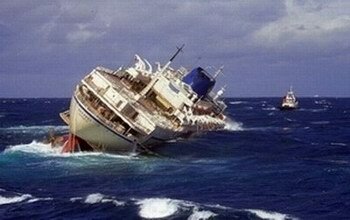 The sinking of the 'Oceanos' off the African coast. Photos used by permission of freelance photographer Gary Horlor. Click on the images to go to his website. 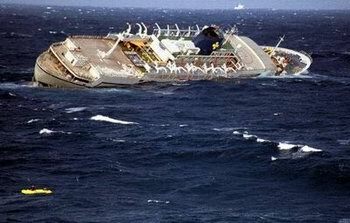 On the night of August 3rd of 1991 the stricken cruise ship 'Oceanos' suffered an event that caused a failure of the check valve for the holding tanks and began began taking on water in rough seas off the South African coast. Realizing the fate of the ship, the crew fled in panic. They neglected to close the lower deck portholes, which is standard policy during emergencies. No alarm was raised. There had been no official announcement of the situation by the captain. Passengers remained ignorant of the events taking place until they witnessed the first signs of flooding in the lower decks. At this stage, eyewitness accounts reveal that many of the crew, including Captain Avranas, were already packed and ready to depart, seemingly unconcerned with the safety of the passengers. With the engine room flooded the generators were shut down and all power was lost. Late that night as the ship began to list to starboard the passengers soon realized among themselves that the ship was in serious trouble. It was then that they saw an amazing and profoundly disturbing sight. They saw their crew abandoning the stricken ship in the lifeboats. The passengers had been "left behind!" What an awful surprise that must have been for the people left on board when they realized that they had been deserted. They had been "left behind"! They were all alone on a sinking vessel at night! There had been no announcement by the captain as to what was happening. The passengers had been left completely in the dark. They had been given no clear instructions. Nor had they been given assistance in abandoning the ship. No responsible leadership for putting the passengers into the lifeboats had been forthcoming by the ship's officers and crew. More than 200 people, including elderly and infirm passengers, had been left to fend for themselves. They had been abandoned to their fate in a watery grave. What an awful and shameful state of affairs! It was the captain himself who had set the pattern for the desertion by the crew. Quite early in the drama he himself had tried to abandon ship with his deserting crew members! The passengers stopped him just as he was making a dive for the lifeboat! What an appalling dereliction of duty! "I don't care what people say about me,'' the captain later said. "When I give the order abandon ship, it doesn't matter what time I leave. If some people want to stay, they can stay." He later told the press that he felt he could direct the rescue operations "better from the shore" than from his place on the bridge of his sinking ship. See the YouTube video below. What happened next? Well an entirely new leadership emerged from among the ships entertainers! They rose to the occasion and organized an orderly rescue by helicopters of the South African military. An interesting note was that the band played music during the sinking to calm the passengers. Indeed the entire entertainment staff assisted the passengers in abandoning ship. This is reminiscent of Titanic where the ship's musicians played almost till the end. This was invaluable in such a situation and almost certainly prevented panic. Our sea-going entertainers seem to come to the fore when they are needed most. All 571 aboard the Oceanos were rescued. By God's grace not one life was lost. The photograph above was taken by freelance photographer Gary Horlor. The ship sank soon after these photos were taken. After the sinking the the inevitable questions were asked. Why had the captain and crew not followed those age old traditions of the sea. The dictum, "women and children first" seen during the sinking of the 'Birkenhead' (1852) and "Titanic" (1912) was forgotten. When people heard the story they saw the crew's self-serving spirit in deserting the passengers in their hour of need as being in very poor form indeed. IS CLUTCHING AT THE HEARTS OF CREW AND A GREAT DRAMA UNFOLDS AT MIDNIGHT. Let us return now to rejoin our Apostle Paul Here we see a similar drama is about to be played out. The tempest has driven the stricken ship westwards across the Med. Now, in the darkness the crew knows that land is near. The Island of Malta is downwind of them and getting ever closer. They cannot see the shore. As they vainly try to see through the driving rain they hear the breakers in the distance. They are facing the sailor's ultimate nightmare. Their ship is caught on an unknown lee shore during a gale. It is in the middle of the night. The crew is absolutely terrified. The four anchors, even as four horsemen, are holding the ship back. They are straining to prevent the ship from going into shore. The anchors are holding. But for how long? The crew doesn't believe that they will hold the ship much longer. In their fear they believe that a tragic shipwreck in the darkness is imminent. Their feelings and their fears lead them to believe that if they stay aboard that vessel they are all doomed men. They believe that every soul aboard will be lost when the ship comes in and breaks up in the raging tempest. The feelings they have are natural and quite understandable. They are in a survival mode. And in that mentality they are looking out for 'number one'. They want to get "outta there". During that pivotal final night the Apostle Paul is on deck. The wind is howling through the rigging.. And the ship is lurching like a wild thing in the raging sea. The four anchor lines groan as they play out from the stern. The crew is at the center of the story now. Their time of trial has come. This is their test of true loyalty and devotion. What will they do? At the midnight hour Paul observes something strange. He sees some of the crew members furtively preparing to lower the ship's lifeboat over the side. There they are, supposedly leaving the ship to put out bow anchors. But there is something suspicious going on here. Why would the sailors want to put out anchors from the bow? The ship is being held off the lee shore by four stern anchors. Common sailing lore would question the value of setting bow anchors in this situation. What would it achieve? All this is not lost on our Apostle Paul. The Holy Spirit has alerted him. He takes a careful look and soon discerns what the caper is really all about. These men are about to desert the ship! An American battle flag from the War of 1812 with the famous slogan by Admiral Perry. When we look at the scriptures concerning the future 70th week our emotions can get the better of us. Unless we know the true character of our God and unless we are grounded in His love then cold craven fear can rise up in our hearts. The western church today is very much at risk here. Our Church is steeped in narcissism, and the sort of self attitude that leads down a dark slippery path towards the gates of Hell. We in the western church are not seeking the face of our God. We are not preparing our hearts by His Holy Spirit for the challenging times which lie ahead. We certainly know that a storm is coming. We have see two world wars and now we have rumors of a third. The seas roar and the nations rage (Psalm 2) as we approach the end of the age. In all of this our God extends His loving-kindness to His people, even in the midst of their trouble. Can we trust Him in this? God's people today know that a major crisis is coming. We are not called to be indolent, carnal, self-indulgent absentee landlords of the Kingdom of God. We have a critical role to play. We are His witnesses! If the hour of trial was to come upon us next year, (say), just how would we fare? Would we demonstrate true loyalty and Christian devotion? Or would we crumble into state of confusion and fear, not knowing what is happening and not knowing our God and not knowing what we are supposed to do? Dear saints let us get nautical here for a moment. The Covenant People of God are all members of a great company. We are the sailors, if you will. We have been commissioned to do our part as our Captain brings in that great ship of destiny. As Christians we have all signed on to serve our beloved Master on board that ship. Even now the ship is making passage through the high seas and out among the nations. The times ahead will see the vessel carrying the Congregation encountering a raging tempest, even a raging of nations. The company of God will be storm tossed for a seven year period of time. At the very end of it all and after many adventures our coming Messiah will bring the ship to its final destination. And we all shall come into the promised haven of rest. God Himself will be taking charge here. He will be bringing His people home. Can we stay with Him in this? This is not a calling in which God has made no provision for us. "Lo, I am with you always, even until the end of the age". As we see here, our commission extends right through to the end of the age. 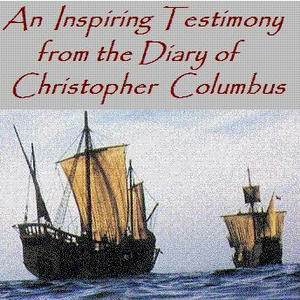 If we are true Christians we have signed on for the full duration of the voyage. We have not been given leave to exit our posts aboard until the ship comes in. The time for us to disembark will be after the vessel enters the glory and comes into port at the end of the voyage. This will be that magnificent and celebrated 'haven of rest' the hymn writers have shown us. So, we must face the Bible facts here. Any thought of 'skipping out' early is a big mistake. It is, in fact, unthinkable. It is just not an option for us. Do we understand this? Faithful Chinese Christians understand these things. They know their God better, it seems, than we do. Of course the Pre-Tribulation Rapture doctrine failed them miserably back in 1949 when their times of tribulation came in under Mao Tse Tung. Corrie Ten Boom tells the story in this article. Now these tried and true brothers and sisters over there know better. They know their God and they understand what true loyalty and Christian devotion is all about. How about us in the west? We are supposedly the bastion of Christendom. When will we begin to get the message? In his introduction to the Book of Revelation John the Beloved apostle wrote to us that those things to come are all about the Revelation of Jesus Christ. The word 'Apocalypse' means an 'unveiling'. Here is a little question for us. Just who will be revealing His grace and His character of righteousness in the end-time drama? Who are those people who will be bearing faithful witness to Him before He comes in the clouds? Who will be the ones to share the Good News to the nations before Messiah comes in judgment and deliverance? To answer that question we need to get our facts clear from the Bible. The information we receive from the mouths of men needs to be checked sentence by sentence against the gold standard of the Holy Scriptures. When the four horsemen and all the rulers of humanity have completed their ride and all is said and done the spotlight of holy history will then pass on to feature the next show on God's agenda. It will be and must be the 5th seal. This is the bridal witness of the end-time saints. At that epic time there will be a Christian company who will come onto the stage of holy history. Their testimony will be on behalf of all the saints who have lived during the past 6,000 years. - Heb.12:1 Their witness will be conclusive and accepted by the Ancient of Days in the courts of heaven. Oh yes, He is the sovereign ruler of the cosmos. He is the One calling the shots here. - Dan.7:9-10 The nations are as a drop in the bucket. - Isa.40:15 In that day the saints will speak the Word of God as the Holy Spirit gives them the words to speak. - Luke 12:11-12 And there they will make their stand until this age comes to it grand conclusion. At that time the saints, (and half the Christian believers who have ever lived are living today), will be bringing the climactic 'final witness' before men and their angels. The Elect of God, drawn from both Israel and the Church, will testify before kings and rulers; before thrones on earth and thrones in heaven. Dear saints, the final climactic, epic, historic, and conclusive 5th seal witness of the saints has been written in the scriptures. - Rev.6:9-11 It must happen. John saw the 5th seal unsealed by Jesus Christ Himself. So He is in control of this. It is prophesied to happen. It must come to pass. And it must come to pass before the 6th seal is opened and the sign of the returning Son of Man is seen in the heavens. - Rev.6:12-17 This will mark the end of those seven years of the 70th week of Daniel. Apparently the rich and pampered western church is not ready to accept this message. They refuse to even look at the Word of Word here or to face the facts of Holy Scripture. The lukewarm Laodicean Church of the latter days doesn't seem to want to hear of such things, even if it is written in their Bible. We are so selfist and narcissistic that we cannot see anything beyond the world of "me, myself, and I". We are irresponsible Christians and until we repent of this we will not be able to commit ourselves to God's great and glorious program. And as for the end-time witness and the "baptism of fire" (- Mat.3:11) well we just don't see the necessity for any such thing. We have no sense of our place in history and no idea that we have been called to finish the race. We are just not willing to face these truths at all. Nor are we inclined to bother about the preparation of our hearts, our minds and our will for the coming darkness. And we in the west call ourselves Christendom? This is a puzzling business. Chinese Christians and Egyptian Christians and the dear persecuted saints overseas know firsthand about being 'sold out' for Jesus. They understand blood covenant Christianity. And yet we don’t. What is going on here. What is wrong with us? The key seems to be this. These saints are already under persecution. Even now they are showing us the Way of Christ, even the Way of the cross. They are displaying true loyalty and Christian devotion. Every day 500 Christian believers die for the faith in our Lord Jesus. Right now these dear saints are more ready to finish the race than we are. How about our Bible knowledge and our wisdom in the realms beyond worldly wisdom? Are we reading our Bibles as faithful Bereans? Or are we purchasing syrupy Bible prophecy doctrines that suit our spiritual sweet tooth? Are we spending the money God has blessed us in faithful Christian endeavors? Or are we wasting our time and money on false "comfort food" from that religious candy store over there in Fantasyland? John saw the end-time Tribulation Saints. He saw them as as an international company. They were from every nation, race, and tribe. (Rev.7:9-17) Christians in the persecuted Church overseas know the reality of blood covenant Christianity. It seems that we, as western Christians, do not. At least not yet. Yes the Church and Israel is only half committed to their God. So the story will call for them to make their classic mistake. Harlotry in the end-time Church will bring the whole Christian Church into their final trials, their "final exams" as it were. The western church as we see it today is not fit to be raptured. It is compromised and corrupt. There simply must be a refining as we come towards the end of the age. Wise Christians will understand this. - Dan.12:10 Others will not want to hear about such things. They are just not listening. Moses told the people of God that in the latter days they would be corrupted. This would cause them to be led into tribulation. He laid out the situation quite clearly for us in 'Song of Moses'. Does this prophecy apply to all of the Judeo-Christian family? Oh yes. It certainly does! As Christians we need to understand the grand scope of our calling. It is far greater than our precious "personal goals" could ever be. We need to know what we are about. We are the witnesses of Jesus Christ. We are the sons and daughters of the Living God! We cannot avoid this coming history. This will be our adventure, our romance in God, and our glorious destiny as this great voyage of the saints comes to its grand finale. This is an exceedingly wonderful calling. And with it comes a great responsibility of witness for us even as the ship comes in. A FALSE ESCHATOLOGY SET TO MISINFORM THE END-TIME SAINTS. Eschatology is not popular today. Yet it is essential to prepare the saints in the scriptures and in the Christian devotion to which we are called. Unfortunately the only noteworthy church teaching on the end-time is the popular pre-tribulation rapture teaching. What it all adds up to is a cop-out. The scenario has been crafted for sale to the carnal Christians of western Christendom. It is a multi-billion dollar a year business. But this is not important. The ones who set the agenda are still doing a lot of good in the work of the Gospel. The real problem will arise in the future times. When that moment arrives it wiil become all too apparent that the information we have been given is inadequate. Are we being told about this? 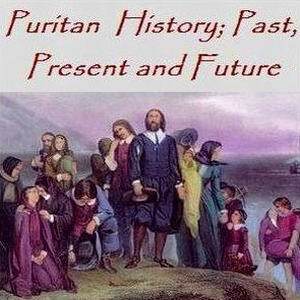 Are being prepared for witness under persecution? Not in the western churches. All we have been told is that the comings times of trial and victory is a valley of death and we won't be there. That is all. This is truly a sad state of affairs. It presents the final seven years of this age as merely a chamber of horrors and little else. Quite clearly this is misinformation. As we seek the face of our God in the scriptures concerning the latter days it soon becomes clear that this information is false and misleading. Apparently it has been slipped into the family of believers by hidden agencies from the other side. Apart from being quite incorrect this negative spin on the end-time is confusing and demoralizing for the saints. Let us survey this Pre-Tribulation Rapture scenario for a moment. As they tell the end-time story things look pretty grim. Any saint found walking around on planet earth during the last seven years of this age is doomed. The story they spin has no Holy Spirit Presence, no hope, no Church, no grace of God, and no overcoming witness of the saints. Every one of these assertions put forth by modern popular Bible prophecy teachers are without scriptural basis. They are false. Not surprisingly, (in this scheme of things at least), there is no grace and no glory for the Tribulation Saints. Dear Christian believers. This business of playing fast and loose with the Holy Scriptures is no small matter. The end-time truth is an exceedingly serious matter. It is not something to 'play around' with. Every single one of these doctrinal errors built into the matrix of the Pre-Tribulation Rapture doctrine are grievous and damaging. They disperse a deadly disinformation that demoralizes and paralyzes. It lays unwarranted fear and an abject despair at the door of the end-time church. Is this a matter of betrayal? The apocalypse is a time of trial, there is no question about it. But it is not the wrath of God! That comes at the end of the seven years, not at its beginning. The 70th week is not all doom and gloom! The Revelation is an unveiling of Jesus Christ. Oh yes. For the wicked His coming will be as a thief and it will be a coming in horror. People who have rejected God will be meeting their angels. And evil angels they will be. But for the saints, the ones who know their God it will be a different story altogether. For us He is coming in glory! The 'Pre-Tribulation Rapture' paints the final contest of the age as an impossible place for a real Christian to be. They tell a story of every man, woman, and child being under the wrath of God for the final seven years of this age, a time when the Body of Christ could not possibly be expected to function. This is patently untrue. When the Bible presents the Tribulation Saints in Revelation chapter seven in glowing terms. They have washed their garments in the blood of the Lamb. They are dressed in white raiment. John saw them to be a huge and glorious company. This victorious company, God’s Elect is gathered from all nations, races and tribes. Yes, they have been under persecution. But they have not been under God's wrath! They are victorious! They are overcomers! This scripture in Revelation 7 is a real eye opener. It unveils the Tribulation Saints. Here we see the Body of Christ in the end-time. Naturally this scripture is an enormous embarrassment to the Pre-Tribulation Rapture camp. So much so in fact that prophecy teachers in the modern and post-modern western church mumble in their beards when the subject of the Tribulation Saints comes up. They are forced by their dispensationalist boxing compartmentalization to say that the tribulation Church will exist in a coming period of time which is 'after the rapture' and therefore by definition beyond the 'Age of Grace', outside the 'Age of the Church'. They are forced by their eschatology to deny that the Tribulation Saints even belong to the Church! How can they be? They are living in a wrath zone! So. With all these incorrect pre-suppositions in place the poor saint who does not read his Bible must listen to and agree with this sad and sorry Pre-Tribulation Rapture escape plan. Having heard that the end-time is an impossible zone of God's wrath he is quite naturally all too eager to embrace the comfortable early departure plan. The way it has been presented to him it becomes a 'no brainer'. With the presuppositions he has been handed it seems there is no other reasonable option. Unfortunately there is a problem with all this. The foundational presuppositions upon which the Pre-Tribulation Rapture doctrine are built up are unsound. They are simply not true! This doctrine has been crafted by men, most of them being Freemasons. Their goal has been to re-engineer a premature ejection of the Church from planet earth before all the trouble starts. They will be caught up into heaven seven years ahead of time. All of this has been elaborately planned and crafted to prevent the Church from even thinking of bringing in the final witness. It is a desperate attempt by the powers of darkness to prevent the end time saints from finishing the race and entering into the glory. The angelic principalities and powers (Eph.6:12) who rule in this present darkness know that the final witness of the saints will be curtains for them. It will be their undoing. This brings us to another issue. Is the western Church ready to be raptured right now? Any responsible church leader who just takes a casual look at the western Church right now would have to admit that we are not yet ready. Not by a long shot. Where is the fine linen, the bridal garments? Where is the righteousness of the saints? Where is the glory? Christ is returning for a glorious Bride "without spot, wrinkle or blemish". - Eph.5:27 Have we seen this vision of splendor? Apparently not yet. Well it seems the present day Church has not yet arrived at that point. The Church today is far from a vision of refined gold and fine linen. Like Gomer, the wayward wife of Hosea, she is deep into compromise with this world. She is deep in sin. Much of the Church has not yet even come to the point of repentance. In Revelation 3 Jesus clearly shows us a picture of the end-time Church of Laodicea. He lays out the pathway for her to repent and get right with God. But we haven't arrived there yet. The western Church today is not dressed in white garments, the righteousness of the saints. She has not purchased eye salve for her spiritual blindness. And she has not purchased her gold, refined in the fire. (See Rev. 3:18) Pre-tribulation rapturism ignores these very important scriptures which tell us quite plainly that our Messiah will be returning for a refined and spotless bride who has made herself ready. As we have seen, this unscriptural and carnal religious escape fantasy of a Pre-Tribulation Rapture is in actual fact a doctrine of desertion. Of course it pleases our flesh-life. The thesis embodies what we think should happen in the endtime. What our flesh would like to happen. This is religious folklore. It is built around the "needs" of "me, myself, and I". It is demanded by the church members and it sells well to the crowds. They bring their dollars into the religious marketplace. Pre-tribulation rapture media and conference sales are in the billions of dollars. This is not a spiritual matter. Our carnal nature, (conditioned by Hollywood), is calling the shots here. Our flesh life and our own egos are driving this belief system. We want to believe a scenario that caters to our own survivalist fancies rather than what God has so clearly conveyed to us in His Holy Word. THE AGE AND FLOWS OF GRACE. IS THIS THEOLOGICAL ANTISEMITISM? Can it get worse? Well unfortunately it does. There is quite a lot more unsavory fallout from this unscriptural and escapist Pre-Tribulation Rapture doctrine. A whole new theology must be crafted to account for the two separated companies in the end-time. These of course are the Church and the Jewish nation. This Pre-Tribulation Rapture doctrine with its early departing church vessel has a problem. If the Jews are not to be cut off then the end-time elect will have to remain split into two companies. God, according to this scenario, will never restore the Church or restore Israel. We end up with what we have now. We end up with two elects! Two ships coming into the end-time shore, one seven years earlier than the other. Is there any evidence of a continuing 'Apartheid of the Elect' in the Bible? Not at all! There is no evidence of such a dichotomy whatsoever! So just what spiritual elements do we have tucked in here with this popular pretribulation rapture fantasy which we see illustrated for us in Acts 27? Here they are. Some strange goings on! 1. We have an impending crisis and an escape whim. We have the emotion of fear and an impulse to fly away from trouble and dodge responsibility. 2. We have a special new 'church vessel' being prepared for an exclusive early departure for a select few. All the "grace" is considered to belong to this early escaping vessel alone. 3. We have an abandonment of the original Jewish company. They will be "left behind"! 4. Finally, we have an elitist section who are dumping their end-time responsibility of bridal witness onto others. They want the other crew members, (whom they have alienated), to finish the job for them! This is precisely what we see in the pre-tribulation rapturist mindset. The Jewish nation and the 144,000, (in their scheme of things), are the people left holding the basket in the harvest fields. The Jewish nation is being dumped on by the escapist Church. In effect they are saying, "The Jews can do the end-time hard and deadly work of witness. The 144,000 can bring their witness before kings and rulers! Does the Bible teach this? Not at all. Meanwhile, the Church fancies herself "outta here". In the pre-trib scheme of things the Church will be in heaven at a special early Marriage Supper of the Lamb. This is supposed to go on for all of the seven years of the end of this age. These early festivities, (the Marriage Supper of the Lamb), is just for them! No Jewish remnant will be in attendance, (as they see it). And the huge company of tribulation saints we see in Revelation 7 will not be there either. This is strange. Why are they cut out of the Marriage Supper of the Lamb? They will be witnessing faithfully on earth during the Great Tribulation. Why should they miss out? John saw that the Tribulation Saints had washed their robes in the blood of the Lamb. Many will be faithful martyrs. But they are not good enough it seems. They are locked out of the festivities! Brothers and sisters, does this sound right? Does this fanciful early escape plan, a dodging of the end-time witness, sound like true loyalty and Christian devotion? And does this eschatological alienation of the Jewish nation sound an ominous note of potential anti-Semitism directed toward our Jewish brothers and sisters? Let us get back to the Bible here. The prophet Zechariah tells us that the Jewish nation will be saved. (Zech.12:10-13:1) But it will be late. Their salvation, both spiritual, political, and military will not come until the Battle of Armageddon very near the end of the age. (Joel 2:28-32) Can we wait for them? And if not, why are we not waiting for them? And why are we planning to leave the harvest fields and absent ourselves from the Great Commission seven years early? Here is another bone of contention. Are there really two elects? Does the Bible teach this? Just what is the basis for this strange non-biblical dispensationalist doctrine that splits up the end-time elect into two elects? And what might be the consequences of this? Doesn't this dispensationalism alienate the Jewish nation just as surely as the Amillennialist "replacemant theology" we saw in the Roman Church and the older Reformist denominations? Is dispensationalism inclined to open the door to anti-Semitism as well? It seems that pretribulationism and its inbuilt hyperdispensationalism has charted two separate destinies for God's people. To their way of thinking God's covenant people are to be forever divided as "the church" and "Israel”, or the Jewish nation". This mindset has determined that there are two elects and hence two vessels on approach into the end time. But is this idea in the Bible? The first elect, (as they see it), is the church departing aboard a special early train to glory in a pre-tribulation rapture. This is the "A" grade elect, the elect destined for grace.. Then, in their scheme of things, there is the Jewish nation, the "other elect" which, (according to them), is to be "left behind". The Jewish nation, to their way of thinking, is apparently a "B" grade elect. But here is the curious thing. This Jewish "B" grade elect are (in their scheme of things) supposed to finish the job for the absentee Church! Where, pray tell, do we find that in scripture? Does the Bible anywhere in its sacred pages ever speak of two elects or two covenant peoples of God? It most certainly does not! A word study of the word "elect" throughout scripture tells the real story. The scriptures only speak of one elect. This is so sad to recount. Denying the message of Romans 11 that "all Israel shall be saved" these teachers of a pre-tribulation rapture affirm that repenting and returning national Israel will not be joining the true remnant church in the end-time. Instead National Israel is to be separated, alienated, and cut off. According to these people the saved Jews will never be joining the refined remnant church. Quite clearly this dispensational pre-tribulation rapture doctrine disagrees with the Bible. The popular doctrine of the day would chop 'the Elect' into two bits. This would presuppose an "apartheid of the Elect" into a “Church” section and an “Israel” section. Let us pause for a moment to consider this. Could our God, the Holy One of Israel, decree such a broken, divided and schizophrenic policy for the children of His Kingdom? Oh yes, we know that His Kingdom is divided today. It has been divided since the days of Rehoboam 2900 years ago. It still remains divided today as "The Church" and "Israel", people championing God's grace and people committed to bringing in His law or righteous rule. But does this mean that His Kingdom is to forever remain divided? Is Israel never to be restored? Is this sad situation destined to continue on into all eternity? Will their be two parties and two celebrations at the end of the age? Will there be a Jewish nation celebration and a Church celebration? The very thought is preposterous. This dispensationalist doctrine pretends to honor the Jewish nation. But does it? An abandonment of national Israel by the Church in the end time by an early special edition rapture is not only unscriptural and shameful it is also quite dangerous. And why is this? Because quite clearly it is anti-Semitic at its core. This is just one more case in the long shameful history of our Jewish brethren being alienated and cut off from the church. This is clearly a departure from true Christian devotion. It is a straight out rejection of way of the cross. Dear saints, is this cowardly and irresponsible notion an example of Christian grace? Don't our Jewish brethren deserve better than this? This is not a small matter. It is a very real concern. Bad theology regarding the restoration of Israel has a way of slipping into the political arena. In times of economic downturn Christians have been shown to have an inclination to act out in shameful ways and produce dark histories involving bloody anti-Semitism. We saw this in the Crusades, the Inquisitions, the Pogroms of Eastern Europe and more recently in the Holocaust. THE SPIRITUAL ELEMENTS OF DESERTION AND DERELICTION OF DUTY. OF LOVING GOD IN CHRISTIAN DEVOTION AS WE APPROACH THE END-TIME. So here in Acts 27 the Holy Spirit has written a play for us. What do we see here in this sea story? The end-time themes are all there. With the crew members we see desertion, abandonment, and dereliction of duty. In the Apostle Paul we see true Christian devotion and a faithful watchman at work. Paul sees the shameful notion about to be acted out. And he stops it just in time. Pray God we can do the same with the Pre-Trib Rapture escapist plot we see in the western Church today. So where do these unscriptural escapist survivalist notions come from? This hidden doctrine of desertion, (like the sailors notion to desert the ship), comes from one main source. It is born in the stormy milieu of fear. The reason is not hard to discover. The nations are raging as we approach the end of the age. (Psalm 2) These spurious yet "normalized" doctrines of desertion are being churned up from the depths. They are cast up like foam on the seashore. This is not surprising really. It is all part of the tempestuous times we live in. 'Fear is the key' in all this. This whole mindset of desertion is spawned from fear. The only antidote to fear is love of God and the resolve to go into a deeper blood covenant devotion to Him. Modern Christians, at least at this point in history, do not love the appearing of the coming Messiah. Without love and devotion to His Kingdom we soon see fear and anger creeping in from the kingdoms of this world. Among Christians living on the carnal side of their nature we see the results. We see a craven bid for personal survivalism. What are we to do to counter this? Fortunately there is a solution. We have been given a high calling in Christ Jesus. So the answer will come out of a love relationship with God in our Lord Jesus Christ. We are told that "perfect love casts out fear". (1John 4:18) That will come by repentance and by coming into a living devoted relationship with Him. Here then are the key spiritual elements we see demonstrated in the shipwreck of the Apostle Paul. We see these very same themes in the popular eschatology of our western church today. 1. We have self centered narcissism in a plot to make special arrangements for a safe passage "outta here" for "me and mine" before the final trials can threaten our lives. 2. We have dereliction of duty in neglecting to follow through with the our Commission and calling. 3. We have desertion of our post and our watch and also desertion of our comrades and friends. 4. We have abandonment of the people entrusted to our care. These are people to whom we have a responsibility. 4. We have disloyalty to the Captain in deserting our post before He has given us leave to go. Is our beloved Messiah, our Captain, trying to tell us something in this sea story? Grace and Shalom to all the elect.